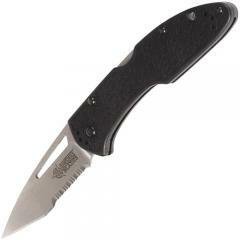 The Blackhawk BHB41 folding knife is a scaled-down version of their popular BHB40. It features a unique modified tanto blade with a strong tip and a sharp, partially serrated edge. An open slot in the blade provides easy manual opening with either hand, and its sturdy lockback mechanism ensures that it stays open once deployed. The handle is also made from durable steel, overlaid with injection-molded nylon. Its surface texture provides a secure, non-slip grip. The knife comes with a reversible pocket clip for portability as well as a lanyard hole at the end of the handle.